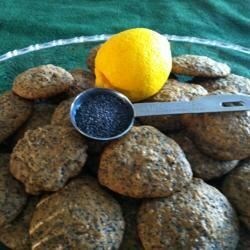 "Poppy seed cookies with a hint of lemon. Delicious!" Preheat oven to 350 degrees F (175 degrees C). Grease a baking sheet or line it with parchment paper. Combine cream and poppy seeds in a small saucepan. Heat mixture over medium heat until mixture is hot; do not boil. Remove from heat and allow to cool. In a medium bowl, combine flour, baking soda and cinnamon. Stir in butter, lemon juice and syrup. Mix well and add cooled poppy seed mixture. Drop by small spoonfuls onto prepared baking sheet. Bake in the preheated oven until edges are golden brown, about 20 minutes. Allow cookies to cool on baking sheet for 5 minutes before removing to a wire rack to cool completely. Husband loves poppyseed stuff so I tried this one. He said it was best with coffee and/or hot chocolate. I'm not a fan of poppyseed, but it makes the house smell wonderful. I had to make 7 dozen cookies... was hard to find the amount of poppy seed I needed. I ended up using less than 1/2 the poppy seed and it still worked well. I made these for Christmas and they weren't too pretty but they were delicious. I would make these for everyday cookies. Great recipe! Unique taste, and really moist after storage in airtight container for a day or two. Definitely a keeper!